Spyderco named this knife after its principal job function, to Assist. The Assist was designed for emergency/fire/rescue professionals (and for the well-equipped civilian) who rely on their knives to function flawlessly under pressure. The VG-10 patented blunt-tipped blade is a toothy eighty-percent SpyderEdged for aggressively cutting seatbelts and fibrous material. The last inch of the tip Spyderco left PlainEdge for detailed cutting (think sharpening pencils). Perched above the Round Hole, a Cobra Hood positions the thumb directly over the hole for quick blade deployment, then doubles as a leveraging platform for the thumb. The wavy pattern cut from the top of the blade (created by a fireman from Sweden) and along the inside of the handle let you place a piece of rope (between the half-open blade and handle) and scissor the blade shut- especially convenient for cutting rope in-and-around flesh without having to fully open/expose the knife's blade. The safety orange FRN handle is a molded wonder of Bi-Directional textured contours and bulges that ergonomically wrap around your palm. In the closed position, squeeze the blade deeper into the handle and a retractable carbide tip protrudes out from the base for breaking glass. Outlined in contrasting black on the handle's spine is a shrill and attention-pitched survival whistle. Carries left/right handed, tip-up by means of a tension wire clip. I just keep it in the car as an emergency knife. Never used the glass breaker but the serrations will cut through cordage easily. 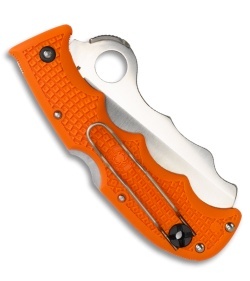 I also have a rescue 3 that I would recommend for pocket carry given the slimmer profile. The thicker handle and cut outs for every finger do give it a more secure grip though. The cobra hood over the spydie hole makes it even easier to deploy with a glove. The FRN jimping seems ineffective and could be improved on. 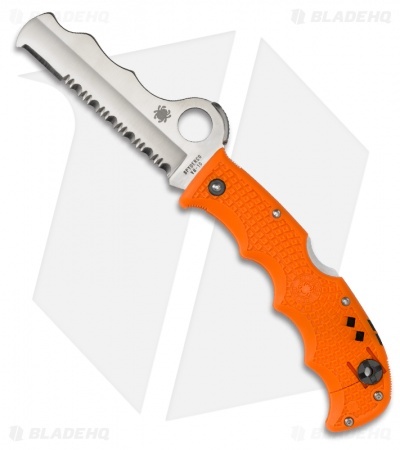 Definitely a niche knife for emergency workers that for the average person doesn't make a ton of sense day to day. Not a bad second knife to accompany something like a delica. Or maybe look at something like a Benchmade Triage which has a more functional EDC blade than the assist but still has a glass breaker and a strap cutter. First I’d like to thank blade hq for their amazing service yet again. After witnessing and helping out in a crash on the highway, I thought it’d best to get myself somthing along the lines of a rescue knife. I wanted something that had great quality and would work when I needed it to. I saw a couple videos on this knife and it’s capabilities and it was exactly what I was looking for. Great blade to cut seatbelts, window breaker, and a dull edge as not to worry about injuring the person your helping. I hope I don’t have to use it in a real situation, but I’d be rather prepared if I had to. Just an amazing knife, really think more people should carry these in their cars, just in case. Ive been EDCing the assist for about two years. I am an EMT the window breaker, easily noticeable color and 3/4 serration made the knife appeal to me. Though I got it as a gift and not from blade HQ I have never had a problem with their service. I use it every day and the serration is still sharp, other than a chip in the non-serrated portion of the blade its still in great condition. I like the window breaker the is hidden in the bottom of the handle and comes out when you squeeze the close knife. I open boxes all day with the window breaker its quick and easy. I get many compliments on the very original blade shape. I would absolutely recommend this knife to anyone considering a good emergency knife.